Sorry I'm a couple days late with this important story but I've had lots of off C2 things to do. However this is such an important reminder that I wanted to be sure that everyone who may not have seen this on TV got a chance to view this important under an hour film. With the tone that is being set in the USA today, it is all the more vital that we not forget this tragic event. Why? So we don't have similar happen today. This is what happens when the workers have no rights and no collective bargaining. The same reasons that held water over 100 years ago are the same important reasons we need to strengthen our Unions around this Nation. Watch the film and you will hear the same arguments by the Elites that are being used today for reason NOT to have this collective bargaining. Lets us not wait for another Triangle Fire, these mostly women stood up for better working conditions, better pay, and were beaten and sent to jail for it. Although some factories improved conditions the workers at the Triangle Fire didn't get all they had picketed for, "safety standards". These women suffered and lost their lives before the Government stepped in and demanded better conditions around the Nation and the first Child Labor Laws. We all gained from their loss of lives don't let their deaths be in vain with a slide back to the "bad old days", people are working longer hours for less, benefits being taken away and watered down, and the owners of the various business, the CEO's, the Stockholders, are never satisfied with the monies they are getting, but want more at the expense of the workers health and lives. If they can't get the workers here to work to their deaths in unsavory conditions they go elsewhere, to other lands that have no unions and they work their people's to their deaths, includes children in horrific conditions that poison their lungs, blister their skin, break their bones, and bring to them an early grave. Brothers and our sisters around the world need to rise up together to gain in this way or at least maintain what they have. The USA had gained in many areas for their own workers to protecting the environment, now these same old business practices are back in force, disregarding EPA standards, buying out the EPA and the Government Leaders to look the other way, dissolving Unions, making the Unions look bad. It's all a repeat of history. There is a reason the Government isn't starting things like the WPA, CCC, or CETA again. If the Government creates jobs there becomes jobs for all who want work, full employment, with full employment the wages are higher as private industry must compete for workers. Keep the people in high unemployment, they know the people will work for less, in worse conditions like the Amazon Warehouse stories I've been placing on here. So our bought out Government is not creating jobs, as it would cause the Private Industry to act and behave in better ways. What a tragedy that was. That is just one reason we need Unions to protect workers. The greedy ones don't care about worker safety. Thanks Dandelion...and ditto Barbara. Will watch the video tonight. I know your family is a strong Union family Barbara and understand fully what having Unions mean. The Elites put out misinformation that has worked at the depletion of Unions to our our demise, and too many people buy into those stories and union hatred. Sure, like anything, there are a few areas of Unions that went wrong, but we do not throw the baby out with the bathwater, we simply reign in and improve where some of the Unions got off track. But mostly, Unions have been good for the majority of the people in the USA and would be good for workers in other lands too. If everyone was in Unions around the world we'd all be better off for it, for there would be no place to go for these Elites to abuse workers and children. Thank you Olivia, when you listen to the words that were spoken many years ago, you will see how the same old tactics are being used today. Horrible, horrible price to pay for the 'privilege' of working (slaving) for the greed and avarice of those who have never known hunger, homelessness, or ragged clothing. These poor women and girls lost their lives because a business owner couldn't be bothered to install some CHEAP safety devices and alarms. Buttwad. But, because of the untimely sacrifice of these ladies, we today, have workplace safety codes and alarms, etc (OSHA). Remember these women from yesteryear, remember their sacrifice FOR US every time a Republican, Teabagger, Libertarian or some other right-wing nutjob says we don't need workplace regulations!!!!! Guess I should have included the men/boys who sacrificed their libves as well. Sorry for the oversight. Was not intentional. Just sl many women/girls, ya know. Thank you Dandelion for the History lesson that I will watch this evening. Keep it up Terrie! Unfortunately I'm unable to send you a STAR! I recently watched the full story of the Triangle fire on Smithsonian Channel. It was very well done kept in step with the history that lead to those deaths. Can't happen again? It happens all the time, American companies have moved to chose their labor force away from the slight oversight of Unions and government agencies designed to protect the employees. It's so easy to turn our eyes and forget the past, it's also easy to forget that last year our own Gulf of Mexico under the auspice of BP cost cutting measures killed at least 11 people and have all but destroyed the health of the Gulf region. If we are not vigilant, we can not expect the government to be a voice for the people. History shows this over, and over. Wow great comments guys...Dande you say this is on tonight??? You have the Pacific Time it is going to be on? I want to watch this! Thanks for getting this out...we need to be aware of these things that happen, sadly most of these horrific things get pushed back in the news and don't get the exposure that is needed. Well said Kit. Also in the story, it stated the owners of the Company these women worked in had also come from poor backgrounds, so how little they chose to remember. Unfortunately, Terrie, a few who do manage to get the right breaks and make fabulous money, often forget their roots, however humble it was. This is the myth that has been promoted, "if I did it, so can you" so if we change anything in the system you won't make it. However the system is set up so few can or do make it, is why we need the oversights, so a bit of fairness takes place. Shirl, I could not agree more. Were it not for unions work conditions here would make Foxcom look good. My husband is a Union man as was his father before him.....We must not allow our rights to be stolen. I know a few, very few, of those owners came from poverty and 'made it', Sheryl. And yes, they CHOSE to forget where they come from which makes of them even bigger monsters than the ones who came from money in the first place. And yes, they do constantly change the rules so that few, if any, can 'make it' like they did. Sorry and sad, isn't it. What greed and power does to a person of little conscience and even smaller character. We have to protect and promote our unions or they too will go the way of the dinosaur. Which would please the fascists to no end. They want nothing better than to have a work force here in America like they have in their sweatshops and horror factories in China, South America, Indonesia, et al. They want slave labor and little to no oversight or government regulation. I think of people such as those who died in t,he Triangle Fire, the BP spill, the chemical and oil/gas refinery fires/explosions (i.e., Texas City) a lot. Too many die for the privilege of working now, today, just as they did back in the late 1800's/early 1900's. It's just plain WRONG! Noted. Thanks for posting Dandelion. I agree Terrie, is why I'm surprised at how many support Ron Paul, for he would like to eliminate all oversight regulations within the market place. Noted! Thanks a lot Sheryl for this important post! I watched the movie, it's very interesting and educational! 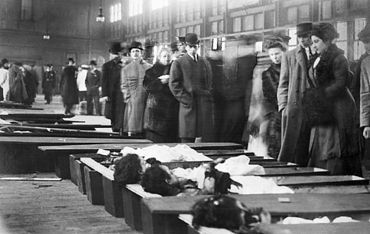 It's truly horrible what happened there in 1911 :( Tragedies like that shouldn't happen anymore, never! The employers should be obliged by law to take all the neccessary safety measures/precautions. It's a shame that in the 21st century there are still factories where the workers safety is not an important priority! I understand your concerns! With the economic crises the common workers in many countries seem to be catapulted back in time as far as their rights are concerned. We need the Unions now more than ever! This tragedy was a turning point in exposing the deplorable working conditions during this period. The unions gained tremendous ground in providing its workers with safer working conditions. Actually, the unions continued to gain strength from this incident on. Child labor laws, and the minimum wage were an outgrowth. What bothers me is, knowing this history, our major outsourced manufacturers still have tens of thousands of people overseas working in similar horrible conditions. Remember when Kathy Lee Griffin was confronted with this issue years ago? Thank you Rita for watching, I know you live in Belgium and this is usa history. I know many think that the people in the usa have it good, and many do have it good or better than other Countries, but it wasn't without a hard earned fight. The immigrants that came from all parts of Europe and Russia were not treated kindly when they first got here, they lived and worked in horrific conditions. Had they not stood up and fought for a better life and way, they still would be in those same conditions, and the Corporate today would like for us to go back to those days if they have their way. Already our wages have stagnated, benefits have been removed, pensions lost, a host of conditions hard won being removed little by little. Is why they set up sweatshops in India, China, Bangladesh, so that they can make the large profits off of poorly paid workers in Countries that offer no protections. Then create conditions in the usa so that we will work the same way if we want a job bad enough. Is why they are not investing here in the usa, they don't want to pay us and work under environmental protections. I can only hope that the workers soon will be or are being organized in those other Countries, and that they will also start to demand that their environments be cleaned up. Thanks Allan, it appears you had typed in your comment while I was still typing mine. I do recall the Kathy Lee Briffin episode and these people should be confronted. Whether it happened 100 years ago or today, it is still exploiting people in a horrible way. Thank you for your gifts of love. What a lovely lady you are! Why thanks Zee, a nice way to start my evening, a smile on my face. Noted wasn't aware of this, thanks Dandelion! Dandelion thank you for posting. I had never heard of the Triangle Fire before and this video/movie certainly tells the story of the young immigrants who came to America willing to work to support their families, and who perished in the worst of circumstances because there was no organized union to protect them!
" 12 red pales filled with water stood impotent in the corner " ! this statement illustrates the uttmost need to protect workers! Conditions in sweat shops in third world countires exist today as noted. We have to take responsibility to ensure the safety and protection and human rights of those who basically have no choice if they want to survive, by working in these dangerous conditions. Basically Dandelion and Kit have mentioned what I would have said, so thank you Dandelion for remembering this horrific day in history because in doing so you and all of us will be honoring the memory of those children, young and old women who perished in the Triangle Fire! Thank you for posting this tragic but important video. We really do need reminders of why our parents and grandparents fought so hard for unions, and we can't let their achievements be taken away from us and therefore our children and grandchildren as well. I'm very encouraged by the way the citizens of Wisconsin reacted to Scott Walker's assault on unions. We're very fortunate to have people like you to remind us that we need to remain vigilant. Thank you! immigrants, should have anticipated the inevitable. NYC being a tinderbox. Thanks for reminding us once again of the tragic events of that spring day in 1911. We would do well to remember what the consequences are when there are no regulations to prevent pro-death disrespect and callous disregard for the lives of the people making you rich. America is becoming more like those times every year that the GOP's far, far right-wing conservatives and the conservatives within the Democratic Party run the show. We have been sliding backwards since the early 70s. As regulations have been gutted state and federally, we are dying more at work. We have seen our economic strength shrivel and jobs disappear, wages stagnate due to "theft" by CEOs, tuition costs skyrocket to such an extent that our kids are graduating with tens of thousands of dollars of loan debt and no jobs to repay them, coal mine and oil rig explosions which kill their workers who never go home again to see their wives and kids. Welcome to life in an increasingly libertarian and immoral playground for BIG Money. When banks rule, people die -- in factory "accidents", from suicide because of lost ways of life, from stress-induced heart attacks, from complications of childbirth (we are getting worse here year after year), etc. Never forget! Never forget what the love of BIG Money gets us. Never forget what the callous disregard for the lives of workers, of neighbors, of fellow human beings gets us. The workplace safety regulations that we have now did not come easy. Sadly, it took terrible tragedies like the Triangle Shirtwaist fire to compel politicians to act. A tragic movie to watch and thanks for reminding us Sheryl.Of course Unions are important but unfortunately less relevant today because of outsourcing,just ask Apple who manufactures their electronic gadgets. Hundreds of people have died from the effects of toxic gases which leaked from a chemical factory near the central Indian city of Bhopal. Uncontrolled capitalism doesn't work and that's why I'm a socialist. Thank you Norm for putting it very clearly out there. Is why I put this piece on, if it stirs a few more people to action and reminds them of what was to stand up to what is being done to us now. What a horrible thing to happen. I am definitely in favor of unions. So sad that they had no one to protect them. That is why we all need to remember that there is only protection with our numbers against those who have no qualms about exploiting any of us. Unions are so important ! When I applied for a job, I was asked to join a Union, otherwise they wouldn't employ me. To be in a Union is a kind of standard here in Europe, I can't believe that the US is so "poor" towards it's workers. As the worlds leading nation I expect better, but instead it reminds me of a "feudal" system. Shame on those who live at the cost of others....and then give a few coins for "charity". This needs to be changed! Thank you Monka. Those in Europe don't loose what you have, don't become like us. Is shameful here. It certainly does neeed to change. The freedom to organize and bargain for safe working conditions and fair wages was hard-won with people's lives. Many countries to which our manufacturing is now "outsourced" do not allow any such freedom or protection. Let us not give up our freedom and rights so easily to greedy corporate owners, and the politicians they want to put in office to oppress us while making themselves richer. VOTE! EDUCATE! Watched a doc recently and realized just how maddening the situation must have been for the families and workers. Seems that most other businesses had already signed on and these owners were hedging about unions and spending a few extra dollars to install alarms/detectors. And yes, worldwide we have much work to do. But don't forget the unfair practices of many a business in the US. Farming for example. Lack of hydration, breaks, and the pilferage of pay for necessities needs to stop. The more we highlight the abuses, the better chance to be protected and assured safety and $$$.